A group of mayoral and City Council candidates promised Friday morning to try to find out if the Sewerage & Water Board of New Orleans still has the $115 million reserve fund intended to pay damages from its major Uptown drainage-canal construction projects, as well as to try to push the entity toward mediation of their claims rather than continuing in a costly legal fight against them. In 2015, a group of property owners along Jefferson, Napoleon and Louisiana avenues filed a lawsuit against the Sewerage & Water Board, claiming that construction of the major new Southeast Louisiana drainage-canal project was damaging their homes through vibration and other ways. The Sewerage & Water Board attempted to blame the damage on the contractors, but a federal judge ruled that the liability was solely on the Sewerage & Water board, and a trial date for the first five homeowners in the case is now set for Jan. 8, 2018. On Friday morning, attorney Michael Whitaker invited candidates for mayor and the City Council to the home of the Leche family on Jefferson Avenue to see the damage and learn about the case firsthand. Large cracks are visible in the outside walls near the ceilings; a hole in the kitchen looms above the staircase where the drywall caved in; and Whitaker said the structural damage will cost hundreds of thousands of dollars to repair. The Sewerage & Water Board has said that it has a $115 million reserve fund intended to pay the damages caused by the construction, and Whitaker said one role the Council can play is to ensure that the fund remains intact, rather than being spent on other emergencies. “We need oversight to make sure it’s still there, because nobody is behind the wheel of the Sewerage & Water Board anymore,” Whitaker said. Mayoral candidate Troy Henry agreed that the money could be at risk, and pledged to look into it if he is elected. Further, Whitaker said that council members and particularly the mayor as president of the Sewerage & Water Board could pressure the entities attorneys to pursue mediation rather than litigation. Up to this point, he said, Mayor Mitch Landrieu has “blown off” the residents, even though he lives in the neighborhood. Charles Napoli, another Jefferson Avenue resident, said his 86-year-old father lived next door to him until the construction made it too difficult to get to and from his house, so he moved to an apartment on St. Charles Avenue until he passed away last year. The residents have gotten no support from the city, he said. “We don’t have anybody on the government side fighting for us,” Napoli told the candidates. District B candidate Catherine Love promised to address the current City Council with the issue this month. 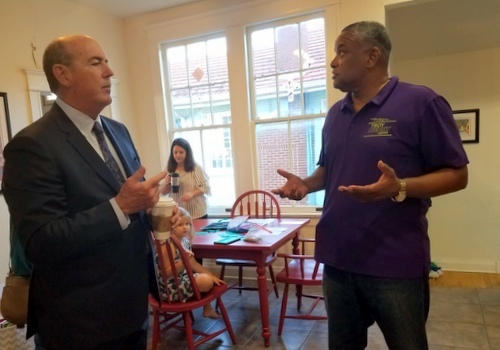 The other District B candidate to visit the house, Jay H. Banks, said he was frustrated to see the city “circling the wagons” and fighting the claims rather than mediating them. District A candidate Joe Giarrusso III said that dragging the claims out has resulting in the city losing both money in attorney’s fees and the goodwill in the neighborhoods. His goal, he said, would be to make the property owners whole again as rapidly as possible. Aylin Acikalin Maklansky, also running in District A, said that the case is another reason that restoring City Council oversight to the Sewerage & Water Board is one of her top priorities. In the meantime, she said, her own experience on the side of residents suing major entities makes her prefer mediation over lawsuits in cases like these. “If there is liability, we need to pay the people’s claims, not the attorney’s claims,” Maklansky said. “I would imagine, as president of the Sewerage and Water Board, she would have the discretion to focus their agenda on fixing the problem,” Whitaker said. David Winkler-Schmit, a spokesman for Cantrell, confirmed that she had met with Whitaker and was planning to investigate the status of the reserve fund. Mediation would be the best end result for the case, Winkler-Schmit said, and Cantrell is committed to helping the residents as the case progresses. The Jan. 8 trial date is before Judge Nakisha Ervin-Knott, Whitaker said. He hopes that she will send the case into mediation, but if not, he is already seeking dates for the next set of homeowners to go to trial.